Matthew is a DPhil student within the School of Geography and the Environment. He completed his BA (Hons) in Human Geography and Film at the University of Surrey, Roehampton; followed by an MA (Distinction) in Film Studies at UCL. He also holds a RTPI and RICS accredited MSc (Distinction) in International (Urban) Planning from The Bartlett, UCL, having specialized in urban design. Matthew brings to his research experience gained from working at The Commission for Architecture and the Built Environment (CABE) in London, England; and the Department of Planning and Community Development (Victorian State Government) in Melbourne, Australia. Matthew's interests span urban design, urban planning, infrastructures, and energies within complex environs; the energy-culture nexus; the cinematic/mediated dimensions of urban space and place; strategic urban planning for sustainability and resilience; and the geographies of Nordic regions and microstates. Matthew also has a developing interest in geopower, geologic agency, elementality, non-representational theories, and more-than-human geographies; with a concern for the ethics and politics of applying new knowledges to the practice of geography, urban planning, urban design, resource provision/management, and the arts. 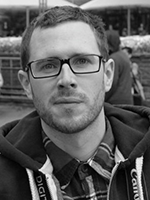 ESRC funded, Matthew's doctoral research examines distinct urban places shaped by proximity to geothermal heat. It explores these places in terms of the engineering and experience of "geothermal urbanism". The work sets out to understand geothermal urban phenomena through socio-technical, hybridised, and atmospheric geographies. In doing so, the empirical focus is on Reykjavík, Iceland. Across its landscape, within the ground that underpins it, and the realm of daily human life flows geothermal heat. It is traced through cooled lava, is frenetic within infrastructures channeling it from deep within the earth, and is absorbed and resonates within and through bodies, buildings, and objects. The key aims are, firstly, to ascertain the distinct components (materialities) of geothermal urbanism within Reykjavík; Second, to understand the juxtaposition and agency of these components within the everyday lifeworld; and Thirdly, to explore how the geothermal urban composition is conducive to a palpable, embodied, sense of place: geothermal urbanism. This research is anchored in critically engaging and building upon a growing body of knowledge on new materiality, geopower, elementality, and the affective capacities and atmospheric qualities of urban environments. The works value lies in better understanding the thermal qualities and characteristics of urban lifeworlds, especially in the context of a low/zero-carbon renewable resource, such as geothermal energy. This research engages Reykjavík's geothermal urbanism through the sites of infrastructures, architectures, and the (human) body. It explores and analyses Reykjavík as a contextual, contingent, geothermal urban composition: a city on top, between, within, amidst, and of the geothermal. The methodology draws upon traditional techniques from geography, ethnography, and urban design (site analysis, townscape analysis, photography, film, interviews) hybridised towards a form of participatory experimentation - a piece of exploratory research with a regard for being inductive of, rather than reductive of, the world. Additionally this work engages geologic agency, political ecology, embodied knowledges, performance, more-than-human geographies and evolving thought on non-representational theories.